Melt butter over medium heat. Saute the onion for 5-10 minutes, stirring occasionally, until translucent (or browned, to your preference). Add the stock, potatoes (peeled or unpeeled) or turnips, cauliflower, carrots and cabbage and bring to a boil. Reduce heat to a simmer for about 10 minutes, then add the remaining ingredients and cook until potatoes and carrots are completely soft. * What’s coconut cream you ask? It’s the same thing as coconut butter, kind of a cross between coconut oil, coconut milk, and dry desiccated coconut – a thick paste (solid at cool room temps) that is great for baking. On the jar it says that a teaspoon in a cup of water makes coconut milk, so I tend to add it to soups and stir fries instead of buying a whole can of coconut milk. I have a lot to use because I grabbed two jars on an impulse BOGO buy here (use the code STEWARDSHIP for 10% off at that site!). 😉 I’m using a lot to make these cookies, too. Yum! * If you don’t have any coconut cream or coconut butter, a can of coconut milk will do just fine (try to find one with the fewest ingredients). Vitacost usually has a very good brand; watch for free shipping and deals, or if you’ve never shopped there, use this link to get $10 off. * I get cooked shredded chicken from making chicken stock or leftover from roasting a whole chicken. Too much work to cook chicken just for soup! * What to do with the rest of the cabbage? 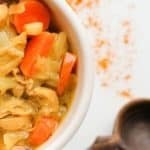 Some awesome ideas (and why cabbage is a great buy) here.